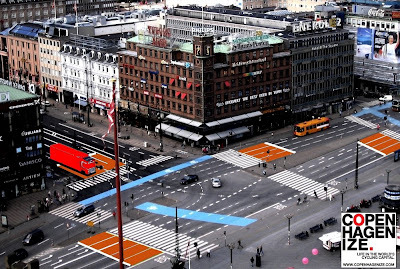 The City of Copenhagen announced yesterday that 117 intersections throughout the city will be altered so that the stop line for cars and trucks will be pulled back by a minimum of 5 metres. Vechicles turning right and hitting bikes is the most common form of accident for cyclists so Copenhageners can now look forward to increased safety around the city. Here's a photo of the main intersection next to the City Hall Square in Copenhagen, taken from the City Hall tower. Hans Christian Andersen Boulevard and Vesterbrogade. 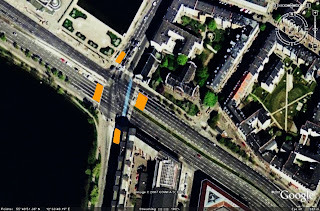 In all haste I coloured the car lanes orange where the new stop lines would be placed. I don't know if this intersection is one of the 117 chosen and I merely guessed at the five metres distance, but it is an interesting indication of how far back the cars will stop from the zebra crossings. There is a truck, coloured red, waiting to turn next to a wide bike lane, which is perfect for this illustration. The idea is that all motorists, but especially truck drivers, will be able to see the cyclists who will be able to stop up by the zebra crossing. It's a great initiative and the fact that 117 intersections will be changed really shows that the City is committed. It will take about two hours to alter one intersection, which is minimal disruption for the traffic. The budget is 3 million kroner [$300,000]. Rather inexpensive and a drop in the bucket for the annual budget of 75 million kroner for bike infrastructure in Copenhagen. Work starts any day now. Here's the same photo with the existing bike lanes marked in blue to give you an idea of how they fit into the picture. 30,000 + bikes pass this intersection each day so many will benefit from the new stop lines. Here's another intersection, previously Denmark's most dangerous until the City redesigned the bicycle infrastructure. Cycliss now avoid the right turning vehicles on a cycle track that continues - free of motorised traffic - to the right at the busiest corner. As well as pre-greens for cyclists and stop lines pulled back five metres. The number of accidents involving bikes has fallen since. From 15 serious accidents a year to just one.